SS8320 4735. Hidden away in a wooded valley or combe along the winding South-West Coast Path 2 miles west of Porlock is the smallest parish church in England, if not in Britain, at the secluded, tiny hamlet of Culbone (Kil Beun or Kil Benn). It’s lovely little church is dedicated to the 7th century Welsh saint, Beuno. The church can only seat about 30 people at any one time, and even that’s a tight squeeze! The original name was Kitnor – meaning ‘hillslope frequented by kites’. The chancel measures 13 feet by 10 feet and the 15th century re-roofed nave 21 feet by 12 feet – a total length of 35 feet altogether. Its walls are 2 foot thick. St Beuno’s church site dates back from before the Norman conquest though the present building is 12th century. There is a nice 13th century porch and a very fine Saxon two-light window, cut from a single block of stone, with a carved face of a leopard set in low relief. The font is probably 11th century but its pedestal is Victorian. In the north wall there is a lepers’ squint hole. Outside in the churchyard stands a preaching cross with a 15th century base. Despite being hidden away the church at Culbone is still a place of pilgrimage for many visitors – they are seemingly not deterred by the 2 mile trek. On Culbone Hill 2 miles to the south-west (on private land) stands the 1 metre high ‘Culbone Stone’ once part of a stone row that stood close by. Carved on the stone is an incised wheel-cross that dates from the 7th-9th century AD, the stone itself being of pre-historic origins. St Beuno probably preached at this stone when he lived for a while in the valley before starting his missionary work in mid and north Wales, or could the church here at Culbone be dedicated to a St Coulban of Brittany? 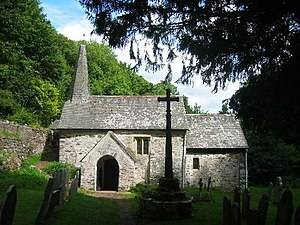 Categories: Ancient Churches & Chapels, Culbone, St Beuno's Church | Tags: St Beuno's Church at Culbone in Somerset | Permalink.